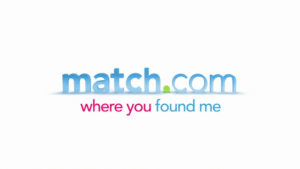 On September 20, 2018, the Illinois Supreme Court suspended Drew R. Quitschau for six months for creating a false Match.com profile—and numerous other fake Internet accounts—in the name of his opposing counsel in a bizarre effort to stalk and harrass her. See In re Drew Randolph Quitschau, No. M.R. 29433 (Sep. 20, 2018). Quitschau admitted to the following misconduct. See Answer to Complaint, In re Drew R. Quitschau, IL Atty. Registration and Disciplinary Comm’n, No. 2017-PR-00084 (filed Aug. 28, 2017). The respondent and Jane Doe were opposing counsel in dozens of family-law cases since 2003. In September 2016, Quitschau created a false online dating profile in Doe’s name and posted that she was separated, does not exercise, and that she liked NASCAR and pizza. He downloaded photographs from Doe’s law firm website and uploaded them to Match.com. In addition, Quitschau created unauthorized online registrations in Doe’s name for other organizations, including the Obesity Action Coalition, Pig International, and Diabetic Living. He also fabricated false reviews and negative, one-star ratings regarding Doe’s professional competence on Martindale.com, Lawyers.com, and Facebook.com. Doe reported Quitschau to Illinois disciplinary authorities and obtained an emergency no-stalking/no-contact protective order against him. See Edith Brady-Lunny, No-Stalking Order vs. Lawyer Over Fake Dating Post (Feb. 16, 2017). 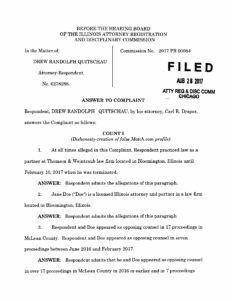 Because Quitschau admitted to violating Illinois Rule 8.4(c), which prohibits conduct involving dishonesty, fraud, deceit or misrepresentation, the only issue in his disciplinary proceeding was the imposition of an appropriate sanction for his unusual misconduct. On June 6, 2018, the Hearing Board of the Illinois Attorney Disciplinary Commission found that Quitschau “engaged in acts of dishonesty, fraud, deceit, and misrepresentation as charged in each of the seven counts of the Complaint, when he registered another attorney on five websites, created a false Facebook account and wrote false reviews of the attorney legal abilities on three other websites.” See In re Quitschau, No. 6278288 (Jun. 6, 2018).